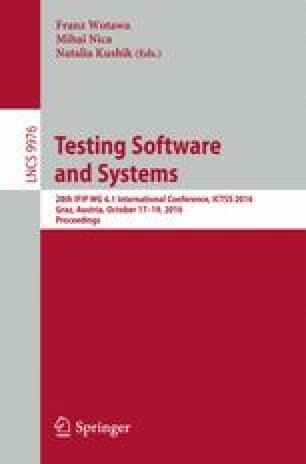 The problem of fault model-based test generation from formal models, in this case Finite State Machines, is addressed. We consider a general fault model which is a tuple of a specification, conformance relation and fault domain. The specification is a deterministic FSM which can be partially specified and not reduced. The conformance relation is quasi-equivalence, as all implementations in the fault domain are assumed to be completely specified FSMs. The fault domain is a set of all possible deterministic submachines of a given nondeterministic FSM, called a mutation machine. The mutation machine contains a specification machine and extends it with mutated transitions modelling potential faults. An approach for deriving a test suite which is complete (sound and exhaustive) for the given fault model is elaborated. It is based on our previously proposed method for analyzing the test completeness by logical encoding and SMT-solving. The preliminary experiments performed on an industrial controller indicate that the approach scales sufficiently well. This work is supported in part by GM, NSERC and MEIE of Gouvernement du Québec.